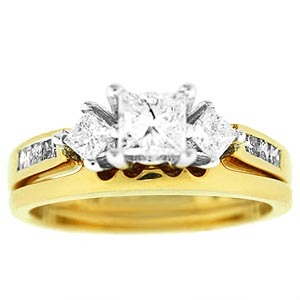 This beautiful diamond bridal set has a diamond engagement ring and gold wedding ring. Engagement ring has a shinning 0.50 carat princess cut diamond center with two side princess cut diamonds and channel set diamonds on the shank. Total carat weight of diamonds is 1.0 Carat. Diamonds are set in 14 karat yellow gold setting.